How to create autonomic balance? StressEraser Pro is a handsome, simple and sensitive device to measure HeartRateVariability (HRV) with your iPhone. On your iPhone screen you can see your heart rhythm and how it affects your emotional system and how you can recharge your stress level. 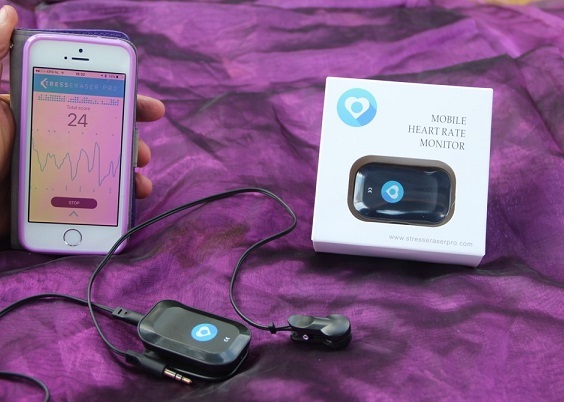 With this Heart Rate Variability biofeedback tool you can train in 8 weeks reaching positive results: more resilience and better selfregulation by balancing your Autonomic Nervous System (ANS) with guided breathing. Guiding the resonance frequency can be compared with guiding someone on a swing by pushing at just the right moment to optimise their swing. 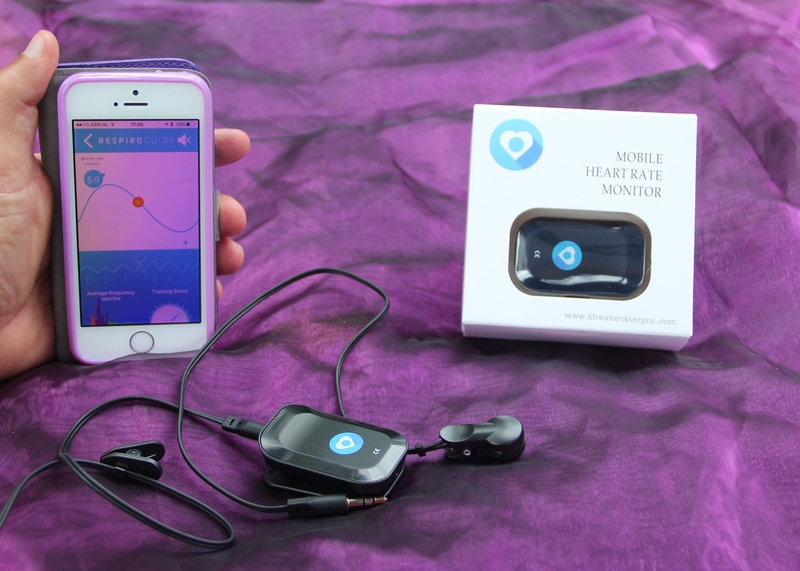 Stresseraser Pro is a free app for iPhone that can be used as a mobile heart rhythm biofeedback device jointly with a monitoring sensor. You can buy the sensor (hardware) in the webshop of this site. When this can be relevant? The ANS is dysregulated in extreme stressfull situations, sleeping problems, posttraumatic stress, depression, panic disorder, but also with exam anxiety, peakperformance anxiety and ADHD. To balance this dysregulated ANS it is important to find your own personal breathing rhythm in which breath and heart rhythm are resonating. Resonance in breath-heart rhythm effects a signal to the brain (amygdala): now there is safety ('social engagement' prof Stephen Porges), in which you have optimal focus and concentration, contact with yourself and other people and balance in your cardiovascular system. Neuroscience in Heart Rate Variability (HRV) with more than 20 years studies and more than 5000 scientific articles show that HRV is an excellent marker of the Autonomic Nervous System and Health, and HRVbiofeedback can bring a dysregulated stressfull mind and body in balance. Resonant breathing and longer exhalation than inhalation are the key for autonomic balance. Autonomic balance creates quietness, better concentration, better sleep and less anxiety. We value and respect your rights regarding information privacy and protection. Safeguarding any personal data you may share with us is very important fort us. Information you provide: name, mailadress and address to send the product StressEraser to you (businessadministration) and to inform you about updates and relevant information about HRVbiofeedback. Data of StressEraser Pro that you personally have provided can be used for scientific research about effects of HRVbiofeedback and enhancing quality of StressEraser pro.